US 2007-05-28 ? points ? EU 2007-06-15 ? points ? AU 2007-08-03 ? points ? 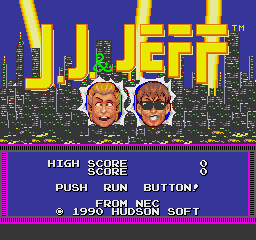 J.J. & Jeff, known as Kato-chan Ken-chan (カトちゃんケンちゃん) in Japan, is a side-scrolling action game developed by Hudson Soft for the PC Engine and TurboGrafx-16. In its original form, Kato-chan Ken-chan was based on the Japanese television show Kato-chan Ken-chan Gokigen TV, with hosts Ken Shimura and Cha Kato assuming the role of playable characters. The game was censored for its North American release due of the copyright and the toilet humor. It is very similar to Adventure Island, but instead to need to get a weapon for attack the enemies, the characters can kick them. Main article: J.J. & Jeff/Magazine articles. This page was last modified on 23 December 2018, at 06:47.